Coming up with creative names for cocktails and garnishing have always been one of the most challenging parts of cocktail creation for me. I’m sure I’m not the only bartender that has this problem. Here are a few things that have really helped me to become more creative when trying to come up with a garnish for a cocktail. Upgrading your glassware is one of the most missed opportunities for increasing the presentation factor of a cocktail. You don’t need to spend $15 on each piece of glass behind your bar, even a occasional trip to the thrift store can add a lot of unique glasses to your bar program. Ice is extremely important when it comes to cocktails as 20-30% of the volume in your drink is from the dilution in your ice. Kold Draft and a few other manufacturers of dense cubed ice can add a lot to the presentation of a drink, but if you have a freezer and some patience, there are a lot of great ways to use ice as a garnish in drinks. You could create different kinds of straws. The one that I made before was actually made from a vanilla bean! Understanding the density of the ingredients that you work with can give you the opportunity to create a dramatic separation in your drink. 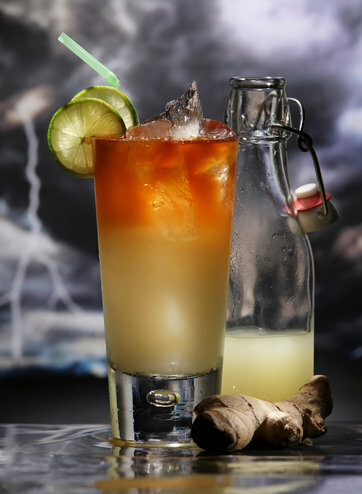 A Pousse-cafe is a great example of this and also a Dark and Stormy. Have fun and get creative with the cocktail that goes in/on the drink. Look to reinforce the flavors that are already present in the drink and look for creative options on how to present them. Grilling/roasting citrus is a fun way to add a smoky note to your garnish, or even using a cookie cutter to create an image out of a plain citrus peel. You can use Herbs and spices to accentuate flavors that may be present in the spirits you are using in the cocktail you are creating. Garnishes can often be an after thought when designing a drink, but arguably it is one of the most important steps in creating a memorable cocktail. Nothing sells a cocktail better than how it looks! What are your ways to create cocktail garnishes? Share it to us in the comments below! Chris, it looks like some of the transitions are cutting off the end of the segments — I noticed this in the glassware section and the garnish section. It looks like I got a little chop happy with the editing software. The new video is already uploaded and should be fixed. Sorry for the miss cuts.